SINGAPORE - By the end of this year, you no longer have to bring cash when you eat at some hawker centres here as they will allow you to pay via Nets FlashPay. 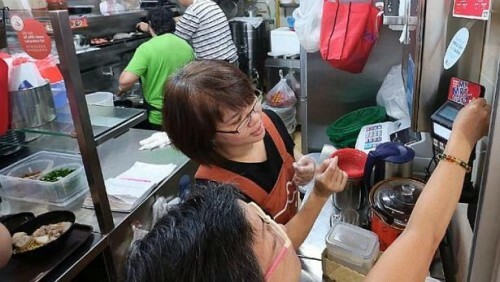 The system will be introduced in 10 to 20 hawker centres over the next few months, the chief executive officer of Nets, Mr Jeffrey Goh, announced on Sunday at the opening ceremony of Bedok Interchange Hawker Centre, which is one of three places here that already offer this payment option. The other two are Beo Crescent Market & Food Centre and Clementi 448 Market & Food Centre. Said Mr Goh: "For quick service industries such as hawker centres, contactless payment provide speed, convenience and hygiene. For instance, it takes less than a second to complete a transaction at a stall - so less time is spent queuing up and less manpower is required to man the stall." Mr Lee Yi Shyan, Senior Minister of State for Trade & Industry and National Development, added in a speech at the opening ceremony that the hawker centre marked the completion of the third milestone for the Remaking Our Heartland programme in Bedok. Other upcoming projects in the area include the revamp of Bedok Town Plaza and Heritage corner.